National Caregivers Day is observed annually to provide support to those who care for loved ones by providing quality, compassionate care on a daily basis. 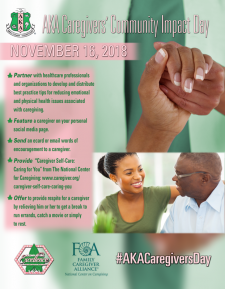 During this special observance, members of Alpha Kappa Alpha Sorority, Incorporated will recognize caregivers and provide much-needed support and respite for them to honor the important work they do for others. Partner with healthcare professionals and organizations to develop and distribute best practice tips for reducing emotional and physical health issues associated with caregiving. Feature a caregiver on your personal social media page. Send an ecard or email words of encouragement to a caregiver. Provide Caregiver Self-Care: Caring for You from The National Center for Caregiving. Offer to provide respite for a caregiver by relieving him or her to get a break to run errands, catch a movie or simply to rest.